(500) Days of Summer is a breath of fresh air: A creative, innovative romantic comedy. Much as that phrase has come to connote creative laziness and utter cinematic banality, I would not try to sort this film under a different genre. (500) Days of Summer explores romance, often in comedic ways, and so the label fits. Even if the recent glut of predictable, monotonous, uninventive, and quite often horribly sexist romantic comedies has made me cringe at the mere mention of the term ‘rom-com,’ there is no inherent reason why romance and comedy cannot blend effectively. As with any cinematic effort, it simply takes creativity, vision, and skill. That is why (500) Days of Summer is such a special film. It is a romantic comedy, but it also bursts at the seams with invention, energy, and talent. Underneath the chemistry of the lead performers and the singular style of director Marc Webb, the film also goes for a complex message, rather than an obvious one, and leaves viewers with plenty to think about. It is certainly romantic, and undoubtedly hilarious, but the film also has something to say, and it says so quite well, often in unpredictable fashion. The film tells the story of Tom, a man who believes his destiny lies in true love, and Summer, a woman who believes love is a farce. Their 500-day relationship, from the day Tom first sets eyes on Summer to the moment he gets over their break up, is dramatized out of sequence as Tom reminisces on their time together. Days from opposite ends of the timeline are shown right next to each other, impressive juxtapositions that are only possible in a non-linear story. Webb employs split-screens, an elaborate dance number, animation, and many varied visual styles to tell a story that is, for the most part, a little different than any romance-based story in recent memory. As Tom, Joseph Gordon-Levitt has a tough task; because the story is non-linear, there is no time to establish and build his character at the outset, especially considering how much Tom changes over the course of 500 days. Levitt is more than capable of building a detailed and three-dimensional character regardless, so confident and compelling in the role that we always have a good sense of who this character is, even if the story does not have time to tell us. Zooey Deschanel is equally good as Summer, and though I cannot substantiate this, I would bet the role was written for her and her alone. Summer is a conglomeration of every performance I have ever seen her give, distilled to the purest elements and layered with nuance. Deschanel has a very distinct, somewhat quirky acting style, and I cannot imagine another actress in this part. She is perfect, an alluring, bewildering, and complexly transfixing presence. Best of all, she and Levitt have amazing on-screen chemistry. One of the film’s few weaknesses, however, is the supporting cast. Outside of Tom and Summer, who are great, well-defined characters, I found myself disliking just about every other character. Tom has some friends and co-workers who are obnoxious and, therefore, supposedly funny, but I did not find them interesting in the slightest. The ‘male-protagonist-with-annoying-friends’ concept has been done a million times, and is the single romantic comedy cliché the movie succumbs to; the fact that the rest of the movie is so creative only makes this element more disappointing. But this is Tom’s story, and the film’s focus is strong, so the lack of interesting supporting characters is not a huge deterrent. And though I liked the film well enough for the first hour, it is the last half hour, where everything comes together in satisfying and thought-provoking fashion, that makes the film worth it. Many films are defined by their ending, and (500) Days of Summer has a phenomenal one, a thoughtful dénouement that offers a strong and intricate message on the complexities of love. Not every moment or element of the movie is sunny and happy, but I cannot imagine anyone leaving the film without a smile on their face. (500) Days of Summer is an extremely entertaining and fun movie that I highly recommend; it stands among the most creative and refreshing films of the year, and I very much hope it finds a big, receptive audience. 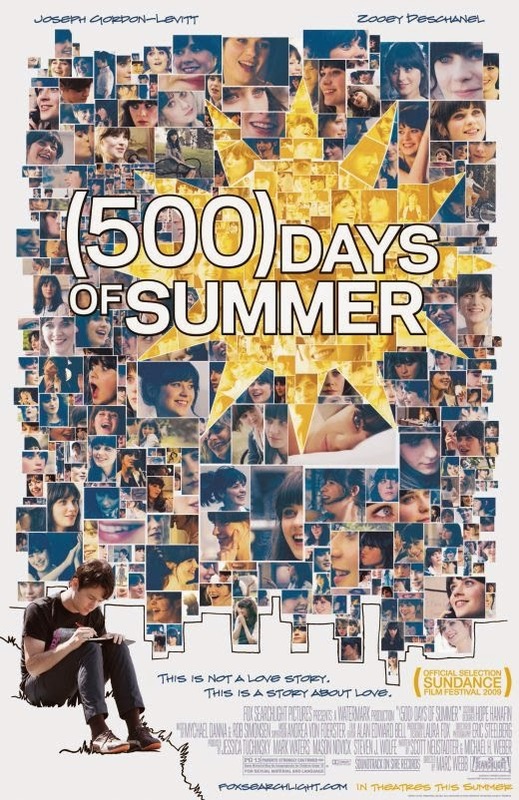 The general public is accustomed to formulaic romantic comedies that offer the same story, over and over again, with only minor variations; (500) Days of Summer proves the genre has a lot more to offer, if only the filmmakers have passion, ingenuity, and real, honest vision.